Nemanja Vidic's summer move from Manchester United to Inter Milan could be confirmed soon, says president Erick Thohir. Inter have been the hot favourites to secure the Serbia centre-back's signature at the end of the season ever since he announced that he would be leaving Old Trafford. Nerazzuri director Piero Ausilio confirmed the club's interest earlier this month and now Inter president Thohir has told the Italian media that a deal for the 32-year-old is close to being agreed. "I don't want to announce something that's 90% done. I think it's better to make an announcement when it's complete." "I don't want to announce something that's 90% done," Thohir is quoted as saying on Inter's official website. "I think it's better to make an announcement when it's complete. "I don't want to speak on something that's not done yet." Vidic's impending departure was confirmed via an official United statement on February 7. He said at the time: "I have decided that I will move on at the end of this season. "I want to challenge myself again and try to make the best of myself in the coming years. "I'm not considering staying in England as the only club I ever wanted to play for here is Manchester United and I was lucky enough to be part of this club for so many years. "I've got a few options to move on and I will choose the right one for me and for my family." Vidic arrived from Spartak Moscow for £7million in January 2006. He has played a central role in virtually all United's significant triumphs since then - he recently revealed that he handed his first winners' medal from the 2006 League Cup to Giuseppe Rossi, as the Italian had played in all the previous matches up to the final. 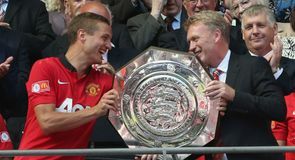 Last May, Vidic skippered United to their historic 20th championship - his fifth and the last under Sir Alex Ferguson. However, the tough defender made only 19 league appearances as he battled to overcome a serious knee injury, suffered in a Champions League defeat to Basle in December 2011 that required two major operations, ruling Vidic out for extended periods on both occasions. So far this season, he has made 17 Premier League starts and a further six in cup competitions. Meanwhile, Thohir also spoke about Inter's current form, which has seen them rise to fifth in the Serie A table after victories over Sassuolo and Fiorentina. "We have won twice in the last two games," he added. "The team is good because they are well balanced. "With (Walter) Samuel, the defence is tighter. Before Hernanes' arrival, there was only one attacking option, but now we can attack also in the middle and not only on the wings." Inter have the weakest back line of the top six teams in Serie A, with 28 goals given away in 24 games. Despite their recent improvements, they are likely to miss out on playing in next season's Champions League. The Nerazzurri trail 11 points behind Napoli, who are third and hold the last qualifying spot for Europe's elite club competition. Who bagged a transfer window bargain? We examine the Sky Bet Football League's best value summer signings.